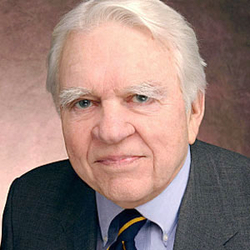 Don't pay attention to Andy Rooney's advice about reading the Koran. "Anyone concerned with what's happening in our world ought to spend some time reading the Koran." Andy Rooney, the famed CBS commentator, gave this advice shortly after 9/11, as did plenty of others. His suggestion makes intuitive sense, given that the terrorists themselves say they are acting on the basis of the holy scripture of Islam. Accused 9/11 ringleader Mohammed Atta had a Koran (sometimes spelled Qur'an) in the suitcase he had checked for his flight. His five-page document of advice for fellow hijackers instructed them to pray, ask God for guidance, and "continue to recite the Koran." Osama bin Laden often quotes the Koran to motivate and convince followers. Witnesses report that at least one of the suicide bombers who tried to assassinate Pakistan's president, Pervez Musharraf, last month was reading the Koran before blowing himself up. Hamas suicide videotapes routinely feature the Koran. And lots of non-Muslims in fact have been reading the Koran. In the weeks after September 11, the book's largest publisher in the United States reported that sales had quintupled; it had to airlift copies from Great Britain to meet the demand. American bookstores reported selling more Korans than Bibles. All this, incidentally, was music to Islamist ears. Hossam Gabri of the Islamic Society of Boston, a group tied to a terrorism funder, considers non-Muslims trying to understand the Koran "a very good development." Profound. One cannot pick it up and understand its meaning when nearly every sentence is the subject of annotations, commentaries, glosses, and superglosses. Such a document requires intensive study of its context, development, and rival interpretations. The U.S. Constitution offers a good analogy: its Second Amendment consists of a just 27 words ("A well regulated militia, being necessary to the security of a free state, the right of the people to keep and bear arms, shall not be infringed") but it is the subject of numerous book-length studies. No one coming fresh to this sentence, especially in translation, has any idea of its implications. Static: An unchanging holy scripture cannot account for change over time. If the Koran causes terrorism, then how does one explain the 1960s, when militant Islamic violence barely existed? The Koran was the same text then as now. More broadly, over a period of 14 centuries, Muslims have been inspired by the Koran to act in ways aggressive and passive, pious and not, tolerant and not. Logic demands that one look elsewhere than an immutable text to account for such shifts. Partial: Holy books have vast importance but do not create the immediate context of action. Reading the Bible in isolation gives limited insight into the range of Jewish and Christian experiences over the millennia; likewise, Muslims have read the Koran differently over time. The admonishment for female modesty meant one thing to Egyptian feminists in the 1920s and another to their descendants today. Then, head coverings represented oppression and exclusion from public life. Today, in the words of a British newspaper headline, "Veiled is beautiful." Then, the head-covering signaled a woman not being a full human being; now, in the words of an editor at a fashion magazine, the head-covering "tells you, you're a woman. ... You have to be treated as an independent mind." Reading the Koran in isolation misses this unpredictable evolution. In brief, the Koran is not a history book. A history book, however, is a history book. Instead of the Koran, I urge anyone wanting to study militant Islam and the violence it inspires to understand such phenomena as the Wahhabi movement, the Khomeini revolution, and Al-Qaeda. Muslim history, not Islamic theology, explains how we got here and hints at what might come next. Jan. 20, 2004 addenda: (1) Louise Marlow makes a similar point in Hierarchy and Egalitarianism in Islamic Thought (Cambridge, Eng. : Cambridge University Press, 1997); I reviewed it in June 1999. (2) I sometime summarize this article as follows: "To understand the present, amateurs study texts and pros study history." (3) If, despite my advice against reading the Koran, you still want to give it a try, I recommend (at my Islam and the Middle East bibliography) the translation by A. J. Arberry, The Koran Interpreted: A Translation (London: Oxford University Press, 1964). Ali Sina, "Yes, study the Quran!" FaithFreedom.org, 21 January 2004. Irfan Khawaja, "Daniel Pipes Is Wrong ... People Should Read the Koran to Learn About Muslim Terrorism," History News Network, 8 March 2004. Sep. 28, 2004: I analyse a phrase of the Koran at "[The Issue of Compulsion in Religion:] Islam is What Its Followers Make of It ," fleshing out the "Complex and contradictory" paragraph above. [British prime minister] Tony Blair unintentionally revealed his ignorance when he said, in an effort to conciliate Muslims, that he had "read through the Koran twice" and that he kept it by his bedside. He thought he was saying something which showed how seriously he took Islam. But most Muslims thought it was a joke, if not an insult. Because, of course, every Muslim knows that you cannot read the Koran through from cover to cover and understand it. The chapters are not written to be read in that way. Indeed, after the first chapter, the chapters of the Koran are ordered according to their length, not according to their content or chronology: the longest chapters are first, the shorter ones are at the end. You need to know which passage was revealed at what period and in what time in order to be able to understand it - you cannot simply read it from beginning to end and expect to learn anything at all. That is one reason why it takes so long to be able to read and understand the Koran: the meaning of any part of it depends on a knowledge of its context - a context that is not in the Koran itself.. Residents of Andheri west recently found an unusual insert in the copy of the morning newspaper. This was a letter by a local Muslim group quoting the supreme spiritual head of Iran Sayyed Ali Khamenei. ... The letter urged readers to not prejudge Islam by the "false propaganda" of Western states, and instead acquaint themselves with the true faith by reading the Holy Quran. "The recent events in France have convinced me to directly talk to you about them. Many attempts have been made to place this great religion of Islam in the seat of a horrifying enemy. Receive knowledge of Islam from its primary and original sources. Gain information about Islam through the Quran and the life of its great Prophet." Comment: This tactic comes as a surprise given the difficulty, complexity, lack of organization, and turgidness (when translated out of Arabic) of the Koran's text.